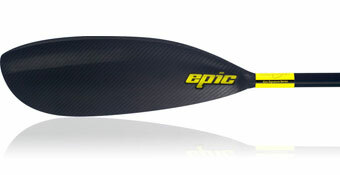 The Epic Mid Wing is a very versatile paddle, with the same area as a Bracsa 4 max blade it is suitable for younger paddlers and women in sprint and marathon. It is also the paddle of choice for surfski racing where the loading can be high. I would also recommend this paddle for longer marathon type paddling. The paddle is extremely light and is adjustable in both length and angle. The full carbon paddles benefit from the same foam core as the signature hybrid blades butbeing 100% carbon fibre they are extremely lightweight and rigid. The blades themselves are clear black carbon finish.